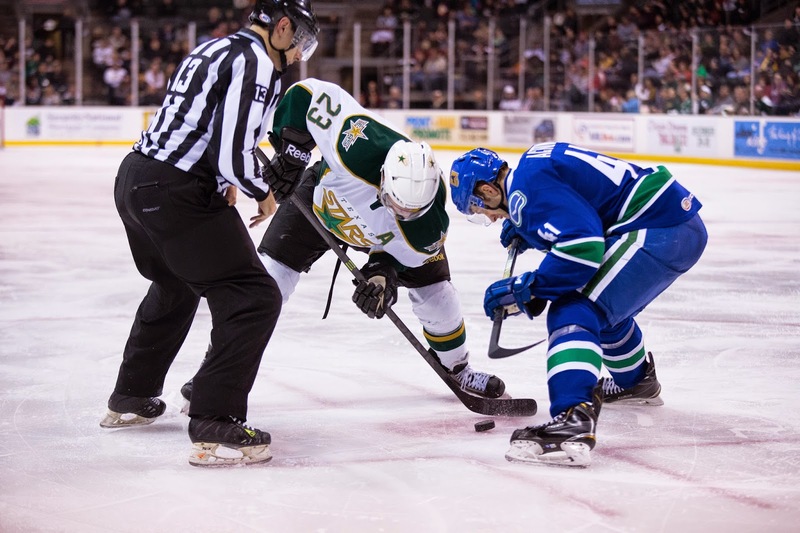 Texas saw a big potential victory come apart in the third period as the Utica Comets overcame a two goal deficit and then scored in overtime to beat the Stars at Cedar Park Center tonight. "We've had a few leads in the third period we haven't been able to close out," said forward Brett Ritchie, who scored in his first game back from injury. "We have mental lapses and get away from our systems. You can't let these points slip away." The Stars went up 2-0 on goals from Ritchie and linemate Justin Dowling. Heading into the third, Texas was up 3-1 with a chance for a big two points in the standings. Coach Laxdal commented, "That's twice now in the last week we've given up a two goal lead in our own building. There's no excuse for it." While the Stars did make it to overtime, they fell to 1-7 on the season in the extra period with a goal off the stick of Cal O'Reilly. "You look at the seven overtime losses, and that's seven points that puts us right back in the pack. We've talked about this. These are critical points we're giving up. When teams come in tired, you have to take advantage and we failed to do that." The Stars jumped on Utica in the first. The Comets played another overtime game last night in Oklahoma City, a notoriously tough back-to-back travel situation with Cedar Park. "We jumped on them early but then let them back in the game," said Laxdal. Brett Ritchie, playing in his first game since November 14th, opened the scoring with a trickler of a goal that just crossed the line behind Eriksson after forcing its way through his pads. "I wanted to make sure I kept it simple at the start," said Ritchie. "I thought I had a pretty good game and felt a little better than I thought I would." Dowling and Scott Glennie assisted. Dowling got one of his own on a backhand rebound of a Maxime Fortunus shot, and the night was off to a great start. Utica got on the board shortly thereafter with another crease play. The puck stopped in the crease behind Texas goalie Jack Campbell. He accidentally knocked it in in the chaos of trying to find it. The goal was initially called off but was granted on review. Travis Morin scored his league-leading 23rd point with his tenth goal of the season in the second. The power play tally came as the reigning MVP found himself all alone with plenty of time in the right wing circle. The 3-1 lead was carried to the second intermission. Within two minutes in the early third, the Stars gave up the lead. Will Acton potted the second goal after an extended Comets' offensive zone possession. Bobby Sanguenetti scored on a power play blast from the point just under five minutes in to make it three all. The Stars had their chances but couldn't find the net with the remaining fifteen minutes. The biggest chance came with a 5-on-3 power play for 80 seconds. "I thought we were forcing plays," said Laxdal. "When you're 5-on-3, you're trying to score so that's a lot of pressure on you. I just didn't like the way we set up." In the overtime frame, Brett Ritchie found himself in the box on a tough tripping call. "I spun because I won the battle off the guy," said Ritchie. "The other guy came through and I got my stick could between his legs. I didn't mean to do it but things happen quick. You hate to be in the box in overtime." Cal O'Reilly ended things for Utica with the 4-3 win on the ensuing power play. Former Star Dustin Jeffrey had the primary assist. Texas hits the road now for a long day of travel to Adirondack, where they will play on Friday.